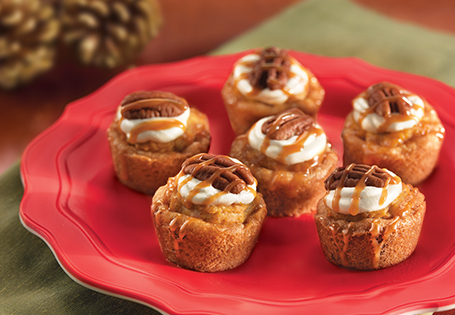 A sugar cookie crust with sweet potato filling, topped with pecans and caramel. Place potatoes in a small saucepan and cover with water. Boil for 30 minutes or until cooked through. Drain and place in a medium bowl. Mash until smooth. Coat a mini muffin pan with cooking spray. Place a sugar cookie square in each muffin tin and bake for 8-10 minutes or until golden brown. Remove from oven and press down the center of the cookie to create a cup. In a medium bowl, combine mashed sweet potatoes, sugar, cinnamon, cream cheese and half of the whipped topping. Remove sugar cookie cups from muffin tin and place on a platter. Spoon sweet potato mixture into cooled cups and top with a dollop of whipped topping. Place a toasted pecan half on top of each cup. Drizzle with caramel apple dip.